Grace was watching videos of the best Siu Lap Chinese barbecue places in New York on You tube. So obviously this led to having a craving for this food. Chinatown Cafe is my go to place for this dish. 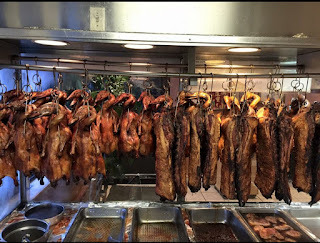 In fact, I think I've only been to one other place that serves this in Chinatown. Buy orange line it's just the closest thing to Tufts Medical Center. You do the Kung Fu school or BCNC thing and the Chinatown Cafe thing and you're back on the train. While the car waits. You can also call ahead. If you think about it, this is the fastest fast food there is. Faster than McDonald's. Everything is already made, and then they just chop it up and put in on rice. Yes they serve other things as well. I often like to get the Fai Yuk Wonton Noodles. (That's like a siu lap wonton mix) But the siu lap is the fastest thing. Sometimes people get it unchopped to serve it at home, where they chop it up to compliment the meal they have already made. You can get just Char siu or just Fau Yuk or you can get a mix. Sam Bo fahn, is three different things on rice. Sam Bo Fahn might be a different combination depending on the place. Today, because Grace watched those Youtube videos she requested Duck, Char siu, and Fau yuk. This order basically fed the whole family... along with Nachos as we watched football. Chinatown Cafe actually has a lot of history and a prime location. So I bet a lot of people have their own stories about this place.